Multi link Charoite bracelet. AAA quality stones in sterling silver. 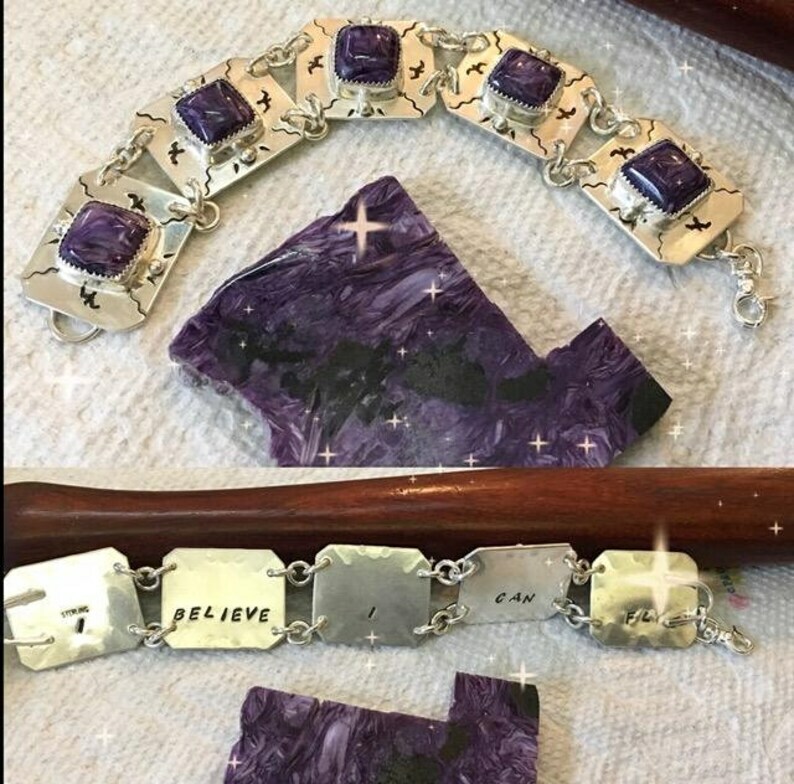 Hand stamped "I believe I can Fly"
This statement bracelet is made with 5 AAA Charoite stones which I personally cut and polished. The settings were hand fabricated and stamped in sterling silver and fine silver. It weighs 47.4 grams as shown which is way over an ounce. Big and Bold and one of a kind! Your next heirloom piece. I know this is pricey but it takes me days to make one of these. Remember it's the equivalent of 5 pendants worth of work and each piece must be matched to the one next to it and line up perfectly. I do take payments and will not repeat the same exact bracelet. Each link is approximately 1 inch long by 7/8 inch wide. The front features a bird in flight at the end of each link and a fine silver sphere on each side of the set charoite stone with other accent stamps. The back is hand stamped "I believe I can Fly" which helped me conquer a smoking addiction 23 years ago. If you're looking for some inspiration for whateve goal you have set for yourself, maybe this will help you achieve it. the bracelet can be finished from a 6-3/4 inch size (with a fold-over clasp) to about an 8 or 8-1/4 without losing it's appearance with the addition of heavy chain links and several clasp choices. If you don't know your size, send me a message (contact seller) and I will give you instructions for measuring. In the smallest size, the bracelet will be finished with a foldover clasp and from size 7 to 8-1/4 I can do your choice of clasp. Choose from a swivel, a fold over, or a hand made toggle. Thanks for looking. Let me know if I can make something special for you with one of the hand cut cabochons in my shop. Or I may have the stone you want in a slab and can cut and polish a piece for your next piece of jewelry. Sterling silver chrysocolla cuff bracelet. Southwest style. solid sterling silver wire leaf pendant. handmade. with or without chain. Owyhee jasper stone pendant. Sterling Silver wire wrapped. Sterling silver opal bug pendant. Sterling Silver horseshoe pendant necklace. 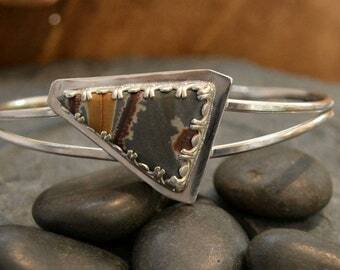 Contemporary handmade silver. "Equinox"
Carnelian cuff bracelet with 14K gold bezel. Solid heavy sterling silver. Sterling silver interchangeable bracelet focal stones 7-12. "Switcheroo". Sterling and Copper bracelet. 'Midnight Mango"